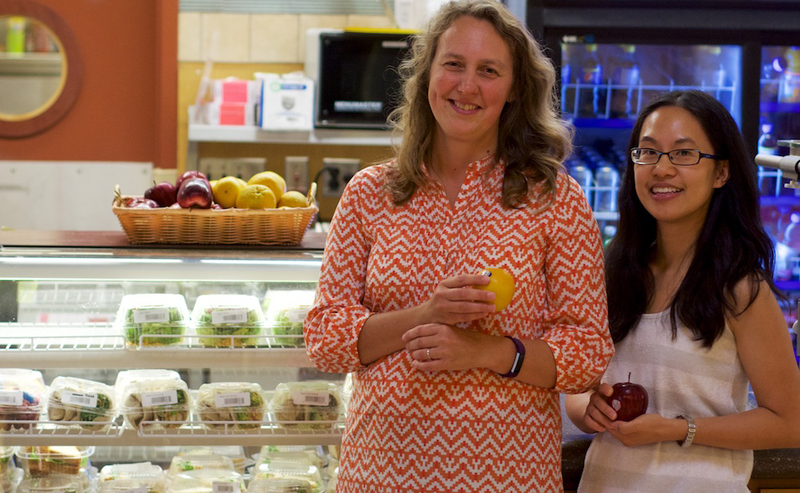 Dr. Lisa Richards (left) and Lydia Lee say efforts to create healthy eating environments across the Region have drawn support. People who purchase food at Winnipeg Regional Health Authority facilities may notice gradual changes taking place over the next while. And if they're the kind of people who are looking for healthier food options, they're going to like what they see. The Region recently announced the rollout of its Healthy Eating Environments Guideline to support all Region sites in creating healthy eating environments for staff, volunteers, students and visitors. 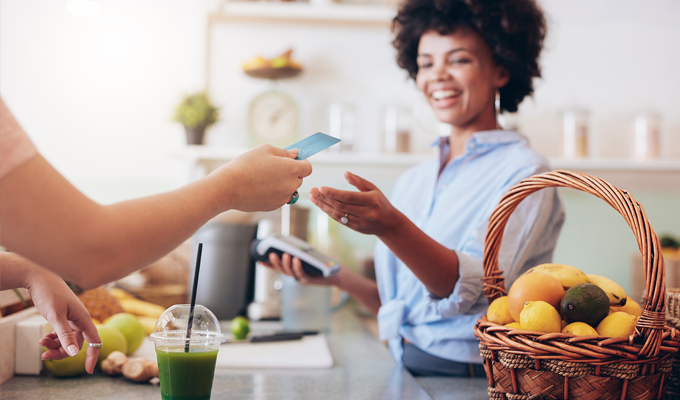 The guideline applies to all sites that operate commercial food and/or retail services, including cafeterias, coffee shops, gift shops, vending and staff ordering catering. Dr. Lisa Richards, a medical officer of health with the Region, helped co-ordinate the effort to set the guideline in place. "Research has shown that the foods we eat can significantly influence our health and well-being, and protect us against many chronic diseases like Type 2 diabetes and heart disease," Richards says. "At the Region, health is at the core of what we do, and we want to support everyone who purchases food in our facilities in their efforts to choose foods that promote health. The Healthy Eating Environments Guideline was developed for this reason." Gina Trinidad, Chief Health Operations Officer for the Region, says that the guideline was several years in the making, and was developed with input from key stakeholder groups including staff, students/trainees, the Region's food service vendors, dietitians, volunteers and visitors. "On the surface, moving toward healthier food choices in a health-care organization seems like it should be straightforward. But before putting this initiative in place, we needed to be sure we had a broad base of support. Opinion on what constitutes healthy food choices varies, and there were a number of complex logistic and financial implications to consider," Trinidad says. For instance, the Region, like many other health regions throughout the country, has contracted out for much of its cafeteria, coffee shop, vending and catering needs. Mandated changes to those contracts could have a negative impact on profitability and on customer satisfaction. "That's one of the principal reasons behind our decision to implement the guidelines slowly, in three phases over the next 10-15 years," Trinidad says. "We wanted to allow staff and vendors ample time to adjust." The guideline, she says, calls for the greater availability of foods that are lower in fats and sugars, higher in fibre, employ healthier cooking methods, and which comply with Eating Well with Canada's Food Guide. The first phase of changes will take place over the next five years and will focus on the promotion of healthy foods and increasing their availability. Subsequent phases will include decreasing the portion sizes of foods that don't meet the initiative's nutrition standards, removing some of them altogether, and continually increasing the variety of healthy foods available. "Several years down the road, when the guideline has been fully implemented, we hope to have retail food environments in our organization that offer affordable, tasty, fresh, healthful and visually appealing foods as the predominant option, making the healthy choice the easy choice for everyone," Richards says. For their part, some of the Region's retail food vendors have been quick to jump on board with the changes. Tara Osborne, District Manager at Eurest Dining, a food services vendor at Seven Oaks Hospital and Grace Hospital, says the new guideline reflects changes that are happening across all industries, as businesses and consumers look for healthier food options. "We understand that our customers have a wide variety of needs and wants when it comes to their food choices. Our goal is to provide them with the options and necessary information so they can make an informed choice," Osborne says. "We have added menu items with reduced fat or sodium, increased the availability of healthier items in our grab-and-go coolers, and labelled all items with nutritional information. We also recognize that sometimes our customers are looking for a special treat, and we want to ensure that we can meet those needs as well. We appreciate that the Region has listened to our input and taken a gradual, phased-in approach that will give everyone ample time to adjust." Lydia Lee, the public health nutrition co-ordinator with the Region who worked on the guideline and its associated nutrition standards, says that it was important to provide a larger number of healthy choices for those who were looking for them, while taking a gradual approach and respecting personal choice. "In today's society, we are surrounded by food options that are high in fat, sugar and salt, and low in nutrients. These foods are heavily marketed to us as consumers, and we naturally prefer their taste. So we often end up making subconscious choices that are skewed towards these foods. However, in our health-care facilities, we felt it was important to level the playing field to make it simple to choose foods that promote health and prevent chronic disease. So as an organization, we are moving towards offering a majority of healthy foods to our customers. "The feedback we received while developing the guideline showed that this is what many people actually expected in our health-care facilities. In an online survey, where over 2,600 staff and volunteers responded, 72 per cent of respondents felt that 75 to 100 per cent of the foods available for purchase at Region sites should be healthy. That was strong support for our initiative," Lee says. "The guideline applies only to retail food sold in Region facilities, with some additional guidelines for catered food and food offered at staff celebrations to ensure that healthier options are present alongside festive foods," Lee says. "There are no limits on the type or amount of food that people purchase elsewhere with their own funds and bring to our facilities. We respect that food can be a very personal choice." Richards says that in adopting its Healthy Eating Environments Guideline, the Region joins other health authorities across Canada - including the Nova Scotia Health Authority and Alberta Health Services - in taking a proactive role in providing healthy food choices as the norm in health-care facilities. "It's the right thing to do," Richards says, "and gives us an opportunity to lead by example. At the end of the day, this is about supporting healthy food environments. Research has shown that the types of food we're surrounded by significantly influence our food choices. Unfortunately, we are surrounded by a veritable sea of processed foods that are high in calories, fat, sugar and salt, and low in nutrients. So for us, creating food environments where it is easier to find and choose foods that promote health just makes sense." A variety of healthy food is available at all times, at all venues. Food and beverage choices and serving sizes are based on Eating Well with Canada's Food Guide. Foods offered are lower in saturated fat, sodium and added sugars when compared to similar foods or products, or foods previously available for sale. Foods offered are low in artificial trans fat. Foods offered are higher in fibre. Healthy cooking methods are used, such as grilling, baking, broiling, poaching, steaming. Healthy food is placed strategically and branded to educate consumers and improve access. Healthy food is strategically priced to improve access.